Most preserved AQM-34's are shown on the individual museum pages. The remainder are listed here. The China Aviation Museum in Datangshan near Beijing, China has a WZ-5 replica Firebee on display. The book 'China today: Aviation industry' contains some information (page 161-162, and photo number 54). It reports that the WZ-5 was developed by BIAA starting in 1969. First two were built in 1972, followed by two more in 1976. Certification was granted in 1980, and it entered service the next year. Airliners.net has four photos of the WZ-5 under its Tu-4 carrier: 1, 2, 3 and 4. 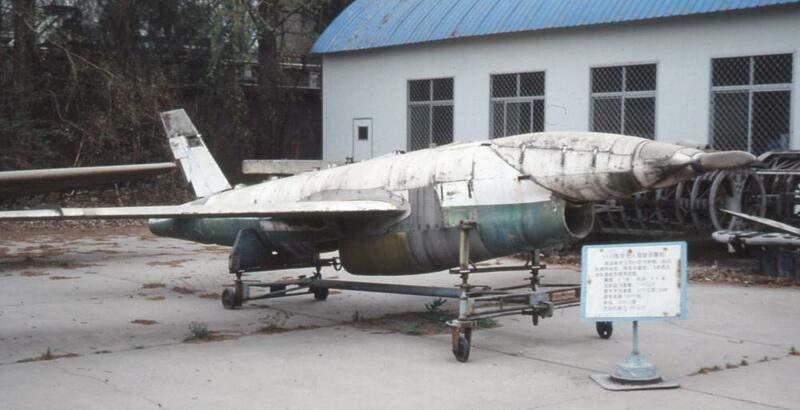 An unknown museum in China has another Chinese WZ-5 replica Firebee on display. For the record, and to avoid confusion, the following museums have a target Firebee on display or in storage. The White Sands (NM) range has an outdoors White Sands Missile Range Museum with around 50 missiles and rockets. During the sixties the collection included a KDA Firebee, that had a red fuselage and white wings and tail surfaces. Three 'parachute' mission markings were painted on the left side of the front fuselage. Currently there's an US Army XM-21 on display, that might be the same aircraft. It is red with black wings and tail surfaces. In a 1957 photo, it's red with a white upper wing and a white fuselage stripe between the wings, and 'XM21' and '001*' is stenciled on the front fuselage (the last digit is unreadable). The VFW (Veterans of Foreign Wars of the US) Post 6560 on the north side of Dayton, OH, has a first generation Firebee on display. It is mounted on a trailer and the fuselage is cut open like some kind of kids riding toy. Kevin Kuhn has photos of it on his Flickr pages. It looks like a Navy KDA-1 or -4, or an Army XM-21, but since the identity is still a mystery, we cannot be sure. The Air Force Space & Missile Museum at Cape Canaveral Air Station, Titusville, Florida, has an Air Force BQM-34A Firebee target drone on display. It is marked as '2310' and has a star and bars national insignia on the rear fuselage. See also the Online Highways Home site. The US Army Air Defence Artillery Museum was located at Fort Bliss (TX) until 2009, and had an MQM-34 on display. The museum was moved to Fort Sill (OK) in 2009, with a new website. In 2012 the museum's collection was expanded with a Q-2A, serial number 56-4112, formerly at the Redstone Arsenal (information courtesy of Jonathan A. Bernstein, Director / Supervisory Museum Curator). The White Sands (NM) range White Sands Missile Range Museum also has a BQM-34A, devoid of markings. The Estrella Warbirds Museum has a BQM-34S, which is a BQM-34A with upgraded avionics for the Navy. It came from the Edwards AFB museum in October 2008, and restoration was completed in September 2009. Originally it was all white with black radome and fin tip, identity 'BQ-19624' on the rear fuselage, 'MSR31' markings on the front fuselage, a blue circular badge on the tail and two mission markings on either side just below the fin tip cap. It was restored with similar markings, but painted orange overall. In May 2017 it was repainted white overall with the same markings, closely resembling the way it arrived at the museum. The Combat Air Museum at Topeka (KS) has a BQM-34A on display. It was recovered in Nebraska, and restored to an immaculate condition by museum volunteers and students of the Washburn Institute of Technology (Auto Collision). It seems to have a small serial number on the front fuselage, but none on the vertical tail. The Air Force Space & Missile Museum at Cape Canaveral Air Station, Titusville, Florida, has an Air Force BQM-34F Firebee II target drone on display. According to this Airliners.net page it earlier had the serial 72-1565 painted on. The San Diego Air and Space Museum has a BQM-34F Firebee II on display. It has serial number 70-01418, and was donated to the museum by Teledyne-Ryan. It hangs from the ceiling, and does not have the belly tank. Let's go see it has a report on this Firebee. The National Museum of the United States Air Force has a BQM-34F Firebee II on display. It has serial number 69-3374, but it appears that all identification markings are absent. It was retired from active service with the 6514th Test Squadron, Hill AFB, Utah, in August 1978. It hangs from the ceiling, and does not have the belly tank. The Air Force Armament Museum has an Air Force BQM-34F Firebee II on display. The serial number is reported as 70-1410 (BQ-15288) and a former Tyndall AFB aircraft. Travel for aircraft has a photo report. The Museum of Aviation at Robins AFB has a BQM-34F Firebee II on display. It has serial number 71-1812, and is mounted on a Air Logistics 3000 trailer. The Castle Air Museum has a Navy BQM-34E Firebee II on display. It has the identity BQ-18644 (44 not 100% sure) painted on, and it is mounted on a Air Logistics 3000 trailer with belly tank installed. This Youtube video at 10:22 has some footage of both the restoration and the display. The AMARC / AMARG disposition center at Davis-Monthan AFB has one BQM-34F in storage: 69-7771, with inventory code AADB0002, arrival date 17 August 1999. It is shown in 'AMARG: America's Military Aircraft Boneyard' page 104. It is listed in an AMARG inventory listing as still present 16 July 2016. It's well visible on Google Maps.